Gordon Fellman teaches courses on Deconstructing War, Building Peace, Social Class and Social Change, Marx and Freud, Sociology of Empowerment, Psychoanalytic Sociology, Sociology of the Israeli-Palestinian Confrontation, and "Public Sociology". This seemingly disparate listing holds together by way of the central question he poses in his courses, in his book and other writings, and in the undergraduate Peace and Conflict, and Coexistence Studies Program, which he chairs: What are the sources, in history and in the self's development and inner workings, of unnecessary human suffering? How can it be thoughtfully, carefully, mindfully reduced? Believing that understanding and action must inform each other for both to be most successful, he involves himself in the community — both Brandeis and beyond — from time to time, to try to realize some of the values and ideas he teaches and writes about. He spent much of the spring semester 1997-98 planning and, with a remarkable group of about 35 members of Brandeis Students for a Free Tibet, carrying out 16 programs called Seven Weeks on Tibet, leading up the Dalai Lama's May 8-9 visit to Brandeis. 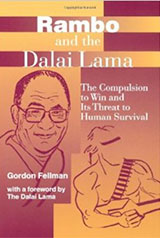 In June 1998, Fellman published the book "Rambo and the Dalai Lama: The Compulsion to Win and Its Threat to Human Survival" (Albany: SUNY Press). This book builds from the proposition that until now most encounters have been organized so that the point of them is to overcome the other. This is true for the most part of relations between men and women, parents and children, whites and non-whites, leaders and publics, rich and poor, labor and management, athletic teams, business firms, advanced societies and developing societies, straight and gay, tall and short, well and ill, and so on. Fellman calls this adversary assumption that one must strive to overcome or submit to being overcome the basis of the adversary paradigm. The ultimate expression of the adversary tendency is murder, and that collectively is war. Historically, alongside the adversary paradigm and in secondary relation to it is the mutuality paradigm, based on the mutuality assumption that the other can be a friend, a colleague, an ally. Fellman claims that a more fully mutualistic society is already at hand, but in minor form that is difficult to recognize until it is identified. His goal is to move beyond analysis in offering hope in the form of visions of mutuality and actions to help bring it about. "Rambo and the Dalai Lama: The Compulsion to Win and Its Threat to Human Survival." Albany: SUNY Press. 1998. Office Hours: Thurs. 10:15 a.m. - 12: 15 p.m.